With Frank Partridge, Inc., New York. Emily Coddington Williams, Newport, Rhode Island; Parke-Bernet Galleries, Inc., New York, 16 May 1953, lot 299. Frederick J. and Annette H. Van Slyke, Baltimore, Maryland; Sotheby's, New York, 21 April 1989, lot 120. Baltimore, Maryland, The Baltimore Museum of Art, Anonymous Loan, 30 March 1964 - 2 October 1969. For a similar vase, see English Pottery and Porcelain, The English Ceramic Circle 1948 Commemorative Exhibition Catalogue, pl. 98, no. 427. 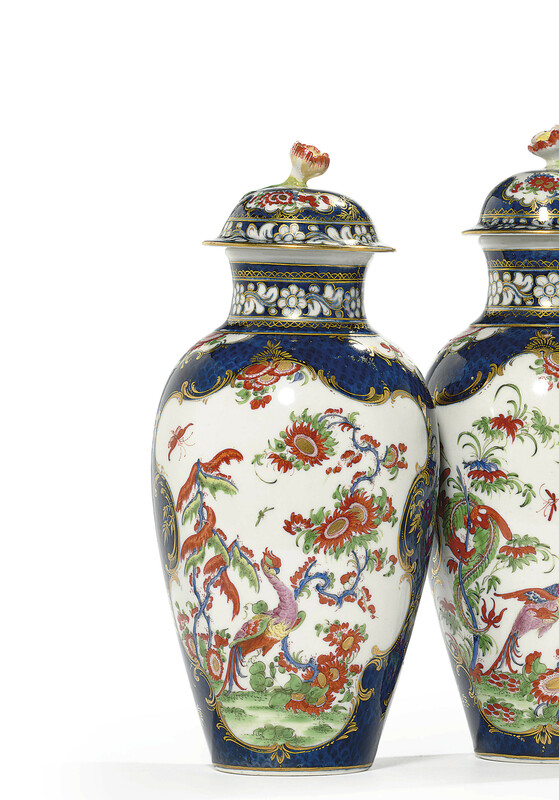 For a garniture of five blue scale vases in the Zorensky Collection decorated in a similar Kakiemon pattern as the present pair, see Simon Spero and John Sandon, Worcester Porcelain 1751-1790, Suffolk, 1996, p. 275, no. 331. Also see the J.D. and Louis Trabue Collection, Sotheby's, New York, 6 April 1988, lot 154, for an example lacking its cover.